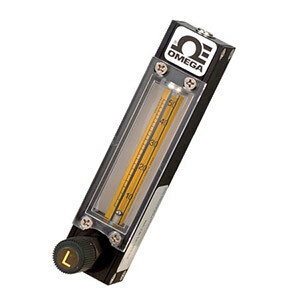 Designed for direct read flow rates, the FLD Series rotameter is a precision instrument embodying the inherent simplicity, versatility and economy of the classical rotameter. It is particularly suitable for metering carrier gases in chromatography, indicating and controlling gases in manufacturing processes, liquid and gas measurement in laboratories, pilot plants, flow and level indicating, etc. Shipped completely assembled, flow meters include standard mounting fittings in a choice of materials, side plates, thick protective magnifying front shield and back plate, built-in control valve, and flow tubes. Panel-mounting style is convertible to bench mounting through the use of the optional acrylic tripod, FLTR-1. The tripod has a built-in spirit leveler and leveling screws. Meters come with built-in 6 turn needle valves, high precision metering valves with “non-rising stems” 16 turn, or with no valves. The higher cost of the high resolution valves is justified whenever high sensitivity control and resolution are desirable-particularly in conjunction with metering tubes of very low flow rates. Generally, for gas metering it is recommended that valves are positioned at inlets (bottom) for liquids valves may be positioned either at inlets or outlets (top). For vacuum services, valves must be mounted at outlets. If unspecified at the time of ordering, meters will be shipped with valves mounted at the inlets.